As a football player at Notre Dame in the 1920’s, Joe Boland was a member of the famed Four Horsemen. 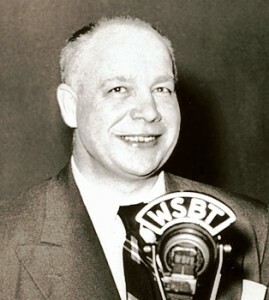 His career continued into coaching, a year of radio sports at WCCO, Minneapolis, and eventually back to South Bend to WSBT in 1942. He had daily 15-min sports radio shows (and later TV) and did play-by-play of Notre Dame and high school sports. In 1947 Boland formed the Irish Network to broadcast Notre Dame football to 190 stations. He also did play-by-play of Chicago Cardinals pro football. Boland died unexpectedly of a heart attack February 26, 1960, at age 55. He had broadcast a high school sectional basketball game the night before.